Stir fries are always an easy way to use up a lot of greens, but they can get boring pretty quickly, so it’s nice to vary the seasoning and prep techniques to make the dish seem new. Dry tofu off on some paper towels. Meanwhile, put a little flour in a dish and heat up a good amount of oil in a large frying pan. Lightly coat the tofu in the flour, shake off any excess and carefully place in hot oil. Cook on all sides until tofu is golden and crispy. Drain on paper towels and sprinkle with S&P. Pour the oil out of the pan into a safe receptacle (never down the sink! put in a heat-proof container until cool, then pour in the trash, or use to power your veggie-oil fueled car). Throw the mushrooms and onions into the pan. Once softened, add the greens and cook until wilted. 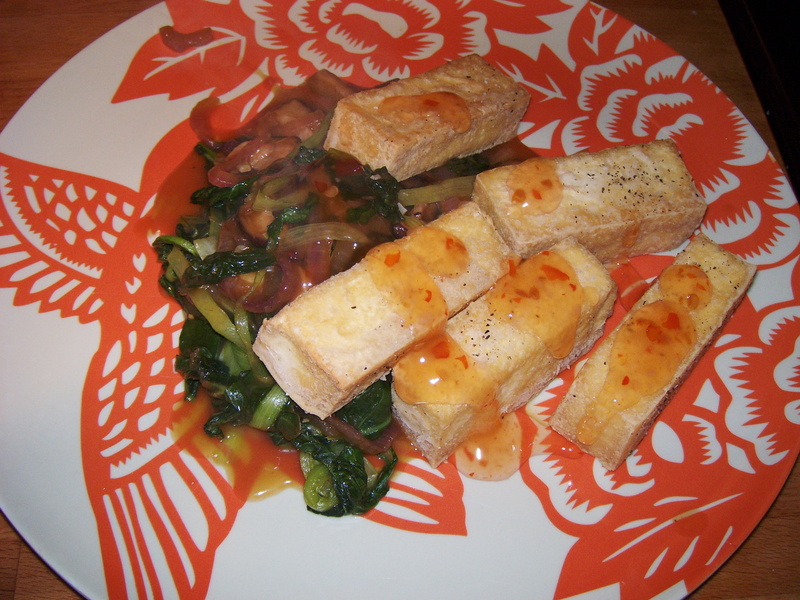 Toss with the sauce and mound veggies on plate, top with fried tofu logs. Garnish with some sweet chili sauce, if desired.